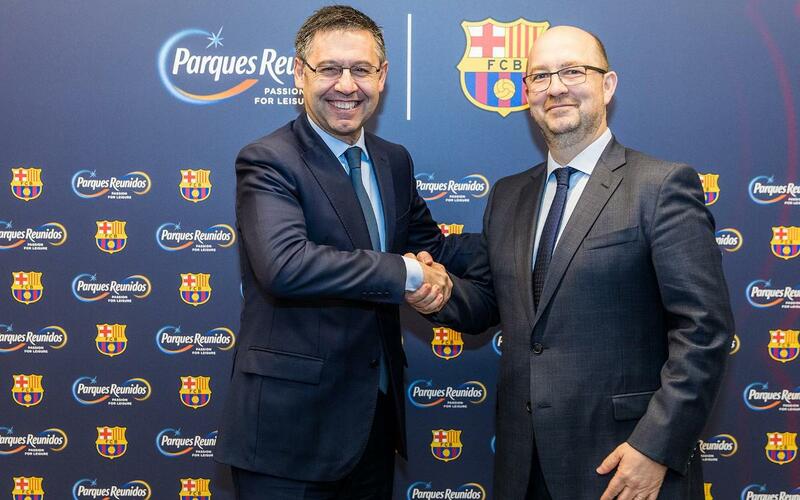 Josep Maria Bartomeu, the president of FC Barcelona, and Fernando Eiroa, the delegate councillor for Parques Reunidos, have signed an agreement that will entitle the company that specialises in leisure parks to build Barça experience spaces around the world. Parques Reunidos will open sites dedicated exclusively to FC Barcelona in at least five shopping malls in strategic regions for the club, where visitors will be able to enjoy an interactive experience with the Barça brand. The first centres are scheduled for opening in the United States and Asia in 2020. The event took place in the presidential suite at the Camp Nou, where Barça was also represented by its CEO, Òscar Grau, and Parques Reunidos by Pedro Cortés, general manager of Corporate Development, and José María Nogueira, head of Corporate Compliance and Communication at this expert company in the entertainment and leisure industry. The five-year agreement was approved by the FC Barcelona Assembly of Delegate Members last November 21. The club is viewing this as a strategic agreement that will project the Barça brand and awareness of the club around the world, as well as creating a major new source of income. Parques Reunidos will be opening 3,000 to 10,000 square metre indoor parks in busy shopping malls and iconic establishments in the centres of cities with high numbers of pedestrian traffic. These spaces will be dedicated exclusively to FC Barcelona, where visitors of different ages will be able to enjoy immersive experiences in this brand new entertainment concept, based on the history, values, players and memorable moments of the club, blending interaction, new technologies, education and fun. Parques Reunidos is a company with more than 50 years of extensive experience in the entertainment industry and which bases its business on theme parks, zoos, water parks and marine parks. The company has a total of 61 parks in 14 countries, including the United States, United Kingdom, Spain, France, Germany, Italy, United Arab Emirates, Vietnam and Argentina. Its parks include Miami Seaquarium, Parque Warner Madrid, Movie Park Germany, Tusenfryd Norway and Sea Life Park Hawaii. “The agreement with Parques Reunidos will help us to project our image in strategic territories like the United States and Asian countries, offering our supporters a 100% Barça experience, and at the same generating a major source of income. They are a leading company in their sector, as shown by how they have worked with Nickelodeon and Lionsgate on indoor entertainment parks like the ones that Barça will have. And that means we’ll be able to continue to set new trends in the entertainment industry”. “This partnership with FC Barcelona represents a major milestone for Parques Reunidos’ growth policy. Our company is constantly looking for new opportunities to expand in order to offer unforgettable experiences for all the family. At these centres, Parques Reunidos will be the first company to offer, hand in hand with one of the best teams in the world, an innovative and thrilling sport and leisure experience for football lovers in Asia, the United States and Europe”.